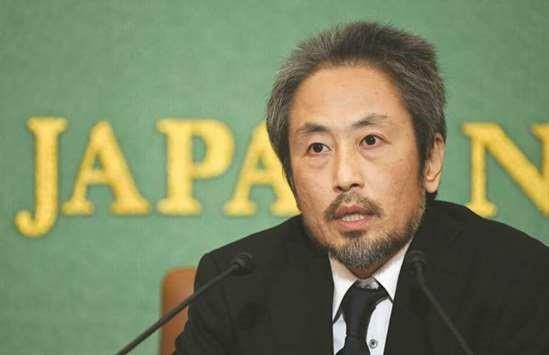 (MENAFN - Gulf Times) A Japanese journalist held hostage in Syria for more than three years said the media must continue to take risks covering warzones to keep the world's attention focused on those caught up in conflicts. Jumpei Yasuda, 44, was kidnapped in Syria the same day he entered the country in June 2015, sparking a lengthy ordeal that he described as 'hell. The freelance journalist has faced harsh criticism in some quarters of Japan for venturing into an active warzone. But he defended himself yesterday during his first press conference in Japan since his release last month. 'When there are things like a violent conflict happening somewhere on earth, there is absolutely a need for journalists who will go there and see what is happening, he said. 'You need information from third parties, not just information from governments. Syria's grinding civil war has cost over 360,000 lives since it broke out in 2011 and quickly became hugely dangerous for reporters with dozens kidnapped, some of them murdered by their captors. Yasuda, who had previously reported from Syria's frontlines, said he was not sure whether he would return to the country or cover future warzones. But he said he hoped his high-profile case would draw attention to Syria's civil war. 'I hope people will become interested in what's happening there (in Syria) and what will happen in the future, he said. Yasuda said he was kidnapped as he crossed into Syria from Turkey along a smuggling route by a group of men who pretended they were there to help him enter the country. 'It was my basic mistake. An unimaginable mistake, he said. He said he was transferred multiple times during his ordeal, adding his treatment ranged from tolerable to torturous. He described being beaten, prevented from moving or making any sound for days on end and being kept in complete isolation. He even converted to Islam so his captors would let him pray, giving him a rare chance to move around, he said. But at other stages of his captivity, conditions improved and he was allowed to watch television, keep a journal and was assured he would not be killed. When he was first kidnapped, there was speculation he was in the hands of the group formerly known as Al Nusra Front, a former Al Qaeda affiliate. But he said the interactions he observed between his captors and Al Nusra members suggested he was not in the hands of the group. Al Nusra's current iteration, Hayat Tahrir al-Sham, denied any involvement in his kidnapping in a statement after Yasuda's release. Yasuda returned home on October 25 after the surprise announcement of his release. There were reports a ransom had been paid for his freedom, in keeping with other hostages freed from Syria. Japan's government has denied that, though Yasuda said his captors told him Tokyo appeared willing to pay to free him. Other Japanese journalists have not been so fortunate. In 2015, militants from the Islamic State group beheaded war correspondent Kenji Goto and his friend Haruna Yukawa in Syria. The Japanese government was criticised for what detractors saw as its flat-footed response to the crisis at the time, including apparently missed opportunities to free both men. Yasuda also struck a contrite note, apologising both to Japan's government and his family for the hardship his ordeal put them through.